Tracy Abrahams : All boxed Up Kit by Stampin' Up! Hi I hope your having a lovely day. I wanted to bring you a super little kit from Stampin' Up! today, It makes 10 little boxes 10.2 x 6.7 x 6.7cm. and they are adorable and so easy to make. 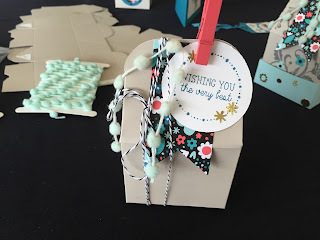 The kit includes all the cardstock, circle tags, printed banners, gold foil stickers, bakers twine, cute pompom trim in a lovely pool party and super cute clothespins in watermelon wonder and island indigo. The boxes are die cut and all ready to put together, you don't even need glue as the boxes come with adhesive tabs. This kit coordinates with the All Boxed up Stamp Set and you would need some ink also to complete the kit I recommend Island Indigo and Watermelon Wonder ink pads. These cute little boxes are ideal for little children's party treats or a little thank you gift. The kit is suitable for adults or children. This is the video of the kit so you can see how lovely it is. I have added the kit at the bottom of my blog, I also have a new October Hostess Code Club Number which is P9CV7MCY This is the code you put in, in the section when it asks you if you have a Hostess code to add. This code is added when your order comes to less than £150. All order less than this amount get added up during the month and then I share all the rewards with everyone that has purchased goods during the month. If the spend is over £150 all the hostess rewards go directly to you and can be used on whatever products or hostess stamp set you wish.